I made a personal goal this year to start rereading books. I’ve never reread any books and I figured I had to start. To me, rereading was always a waste of time (Because my TBR keeps growing) but after the newest Black Dagger Brotherhood book came out. I HAD to do a reread of the first 5 books! I hadn’t read those books since I was 13 and I was pleasantly surprised by my reread. ➽ Harry Potter and the Prisoner of Azkaban: So far I’ve reread the first 2 books in the Harry Potter series and am hoping to finish the 3rd book this month. ➽ Outlander By Diana Gabaldon : I first read this book when I was 13/14 years old and it rocked my world. This was the first book besides Harry Potter that made me lose sleep and time. So I’m way overdue for a reread. ➽ The Devils Cut by J.R. Ward: This is a new release (Just came out today) and I’m already on chapter 2 and I’m in love. This series is so action packed, romantic and drama filled, perfect for ending a book slump. ➽ The Duchess Deal by Tessa Dare (release August 22): when this comes out I’ll be dropping everything to read it! This is so anticipated for me. Tessa Dare is on my Epic shelf along with Lisa Kleypas and Elizabeth Hoyt. This book is the start of a new series for her which I’m sure I’ll love. ➽ This space is for any ebook/s that I pick up and read because I almost never NEVER stick to any set TBR which is why I don’t usually do these. 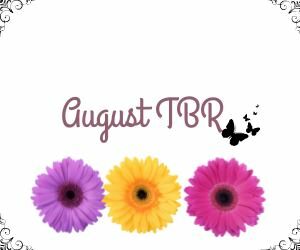 ➽ The Summer Garden by Paullina Simons: I binge read the first two last month and have been stalling on this one because I’m not ready to say goodbye and also because its gunna break my whole heart. ➽ The Rose and the Dagger by Renee Ahdieh: This is the second time I’ve taken this one out from the Library lets hope I actually get to it this time. I love me some Khalid. ➽ Eliza and Her Monsters by Francesca Zappia: I’ve heard so many good things about this one and I love some anxiety rep but I’m not sure I’ll get to it this month…I might which is why I’m including it. But I’m not a big fan of YA contemporary. ➽ Deathless by Catherine M Valente: This is an adult retelling of a Russian folk tale called “Kosechi the Deathless” you may not know this about me but I’m absolute trash for anything Russian related…I love Russian themed books and especially Russian fairytales. So I really want to read this one after I finish The Summer Garden. That’s my very super uber ambitious sorta TBR. I hope you all have a fantastic reading month!